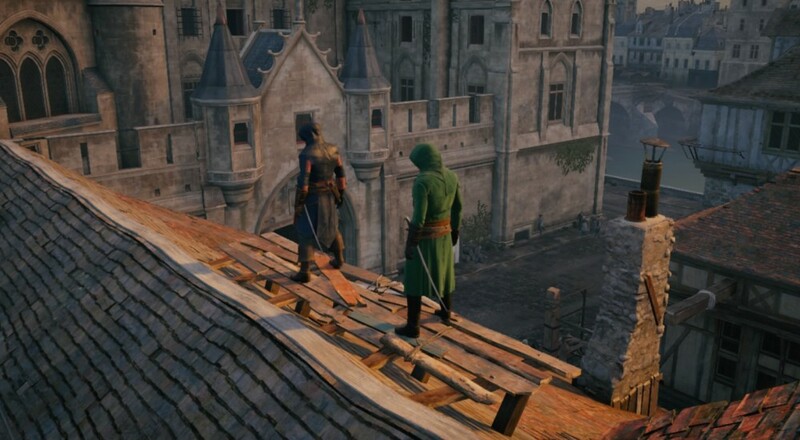 Assassin's Creed Unity was released last week and our little FAQ should help guide you to get connected and start cooperatively assassinating with your friends. How many players can play Assassin's Creed Unity online? Are any other forms of co-op, i.e., couch, system link, or combo, supported? How do I begin a co-op session in Assassin's Creed Unity? Is co-op limited to co-op missions only? How many co-op missions are there to play? What are the types of missions available? How is mission difficulty handled in Assassin's Creed Unity? Does my character have to be at the same difficulty level as a co-op mission to join? Can I join a game if the host is further along than me in Assassin's Creed Unity? How does save game progress work for co-op play in Assassin's Creed Unity? How are item drops handled in co-op? What communication options are supported in co-op play? Up to four players can join the same game. The players can all inhabit the same game world and are free to interact with collectible items, crowd events, and the environment as a whole, but some co-op missions are limited to allow only a max of two players at once. No, the game is online play only. Co-op sessions can be initiated from the pause menu using the "Play Together" option, or inviting players through the appropriate systems on your console of choice. No, players are free to roam around the host player's world. Story and side missions that are limited to one player only cannot be played, but players can gather collectibles together. Co-op missions are split into two types: co-op missions and heists. Co-op missions entail a series of objectives and are formed around a little story arc. Heists involve players attempting to loot a chest or other object while remaining out of conflict with the guards; the fewer times players are detected, the more money they'll earn at the end. There are 11 co-op missions and 7 heist missions available. No, players do not share collectibles. Crowd events, like tackling a thief or killing specifically marked criminals, are shared. Mission difficulty is determined by the enemies you will face in the mission. More difficult enemies have more health, do more damage, and tend to come in larger packs. Having better gear for your character raises your level and makes taking these enemies head on easier, but you do not have to be the recommended level in order to join a co-op mission. Just be prepared to either be really good at stealth and assassinating or dying a lot. Yes, story progression in Assassin's Creed Unity has no bearing on being able to participate in co-op missions. However, all players must have played through the first two sequences of the game in order to access co-op missions. Successful completion of co-op missions is saved to each player's game, along with any rewards and/or achievements earned. Each player receives a random piece of gear from a set of list for a particular co-op mission, along with Francs and Sync points. Replaying the mission rewards a new piece of gear, more Francs, and more Sync points. For Heist missions, the amount of Francs each player receives can vary depending on how frequently they were seen by guards, though the group as a whole is penalized slightly when any player is seen. Voice chat is supported in-game. Social Clubs allow players to form a sort of "clan" in the game. Other players can be invited to join and you can check to see who all from your club is online by checking the "My Brotherhood" and "My Club", or checking one of the "Club Rosters" found in your base of operations or one of the club locations scattered around Paris. Assassin's Creed Gameplay Trailer Features "Celebrities"
Page created in 0.3734 seconds.